For the instrumental composition, see Scarlett O'Hara (instrumental). Katie Scarlett O'Hara is a fictional character and the protagonist in Margaret Mitchell's 1936 novel Gone with the Wind and in the later film of the same name. She also is the main character in the 1970 musical Scarlett and the 1991 book Scarlett, a sequel to Gone with the Wind that was written by Alexandra Ripley and adapted for a television mini-series in 1994. During early drafts of the original novel, Mitchell referred to her heroine as "Pansy," and did not decide on the name "Scarlett" until just before the novel went to print. O'Hara is the oldest living child of Gerald and Ellen O'Hara. She was born in 1844 or 1845 on her family's plantation Tara in Georgia. She was named Katie Scarlett, after her father's mother, but is always called Scarlett, except by her father, who refers to her as "Katie Scarlett." She is from a Catholic family of Irish ancestry on her paternal side, and French ancestry on her maternal side, notably a descendant of an aristocratic Savannah family on her mother's side, the Robillards. O'Hara has black hair, green eyes, and pale skin. She is famous for her fashionably small waist. Scarlett has two younger sisters, Susan Elinor ("Suellen") O'Hara and Caroline Irene ("Carreen") O'Hara, and three little brothers who died in infancy. Her baby brothers are buried in the family burying ground at Tara, and each was named Gerald O'Hara, Jr.
O’Hara begins the novel unmarried, but with many beaus in the county; however, as a result of Ashley Wilkes’ rejection, she marries Charles Hamilton, who dies shortly after the birth of their son, Wade Hampton Hamilton. Later, in the midst of Tara’s threat, O’Hara marries Frank Kennedy, Suellen’s beau, for financial security for Tara and providing for the family. They have Ella Lorena Kennedy together. Kennedy dies in a raid on Shanty Town by the Union army, where Scarlett was attacked, who attempted to stop the raid. She continues to marry Rhett Butler, for his money, again, although she admits she is “fond” of him. They have Eugenia Victoria, a.k.a “Bonnie Blue” Butler; however, she dies after a tragic riding accident. Unable to reconcile, Rhett leaves Scarlett, although O’Hara ends the novel vowing to try and win him back. When the novel opens, Scarlett O’Hara is sixteen. She is vain, self-centered, and very spoiled by her wealthy parents. She can also be insecure, but is very intelligent, despite the Old South’s pretense of ignorance and helplessness. She is somewhat unusual among Southern women, whom society preferred to act as dainty creatures who needed protection from their men. Scarlett is aware that she is only acting empty-headed, and resents the "necessity" of it, unlike most of her Southern belles peers, i.e Melanie Hamilton and India Wilkes. Outwardly, Scarlett is the picture of southern charm and womanly virtues, and a popular belle with the country males. The one man she truly desires, however, is her neighbor, Ashley Wilkes – the one man she can't have. The Wilkes family has a tradition of intermarrying with their cousins, and Ashley is promised to his cousin, Melanie Hamilton of Atlanta. Scarlett's motivation in the early part of the novel centers on her desire to win Ashley's heart. When he refuses her advances--which no “Southern Lady” would be so forward as to make--she takes refuge in childish rage, and spitefully accepts the proposal of Charles Hamilton, Melanie's brother, in a misguided effort to get back at Ashley and Melanie. Rhett Butler, a wealthy older bachelor and a societal pariah, overhears Scarlett express her love to Ashley during a barbecue at Twelve Oaks, the Wilkes' estate. Rhett admires Scarlett's willfulness and her departure from accepted propriety as well as her beauty. He pursues Scarlett, but is aware of her impetuousness, childish spite, and her fixation on Ashley. He assists Scarlett in defiance of proper Victorian mourning customs when her husband, Charles Hamilton, dies in a training camp, and Rhett encourages her spirited behavior in Atlanta society. Scarlett, privately frustrated from the strict rules of polite society, finds friendship with Rhett liberating. The Civil War sweeps away the lifestyle in which Scarlett was raised, and Southern society falls into ruin. Scarlett, left destitute after Sherman's army marches through Georgia, becomes the sole source of strength for her family. Her character begins to harden as her relatives, the family slaves and the Wilkes family look to her for protection from homelessness and starvation. Scarlett becomes money-conscious and more materialistic in her motivation to ensure her family survives and Tara stays in her possession, while other Georgian farmers lose their homes. This extends to first offering herself as a mistress to Rhett; although after Rhett’s rejection, Scarlett resorts to marrying her younger sister's beau, Frank Kennedy, investing in and starting a business herself, engaging in controversial business practices and even exploiting convict labor in order to make her lumber business profit. Her conduct results in the accidental death of Frank, and shortly after she marries Rhett Butler for "fun" and because he is very wealthy. They have a little girl named Bonnie, but she dies from a horseback riding accident that leaves Rhett and Scarlett’s relationship unstable. Scarlett is too fixated on Ashley Wilkes to realize her pursuit of him is misdirected until the climax of the novel. With the death of Melanie Wilkes, she realizes her pursuit of Ashley was a childish romance and she has loved Rhett Butler for some time. She pursues Rhett from the Wilkes home to their home, only to discover he has given up hope of ever receiving her love, and is about to leave her. After telling him she loves him, he refuses to stay with her, which leads to the famous line, "My dear, I don't give a damn." Wracked with grief, but determined to win him back Scarlett returns to Tara to regain her strength and create a plan to reunite with Rhett. Scarlett’s character portrayed in both the novel and 1939 film is, at face-value, unscrupulous and selfish, but her character development ultimately portrays multiple stigmas throughout that support Mitchell’s theme. In a rare interview, Mitchell admitted the theme of the novel was “survival,” specifically shown is exploring human behavior in the face of the catastrophe of the Civil War. Decades later, literary critics and authors agree of Scarlett’s revolution from a spoiled, wealthy girl—typical of her socioeconomic status—to becoming an independent woman in an unforgiving society and unstable economy is a testament to the development of Mitchell’s character. Lisa Bertagnoli, author of Scarlett Rules, compared Scarlett to a chameleon by morphing herself from a pampered girl to a “no non-sense business woman responsible for feeding not only herself, but her extended family as well.". Scarlett stands out in the novel because she alone, among her female peers, is the only one who survives and thrives despite Sherman’s March through Atlanta, despite being widowed twice, despite being a woman in a patriarchal society. She was told “no” to almost every action she did to survive, by both societal standards and her female and male peers around her, such as marrying Frank Kennedy for money or even running a successful business, and in return, she told them “watch me” in the process. Scarlett struggled with her status as a woman because of standards of the “Southern Lady” invoked and shown at the beginning of the novel, and displayed throughout Scarlett’s peers, embodied in Melanie Wilkes. However, this is clearly challenged by Scarlett because of the dire conditions she is meant to face and endure. Therefore, those standards of the “Southern Lady” are discarded because the standards do not meet her physical needs, nor are useful to her physical survival. The essence of the public responsibility of being a “lady” is flagrantly disregarded because of her commitment to survival (Fox-Genovese, p. 400). Thus, she is ostracized from her peers. Scarlett does not uphold the same code of standard as she did in the beginning of the novel because her motivations changed from societal and class standings to economic status and physical survival. 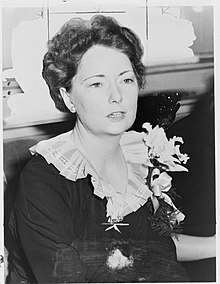 While Margaret Mitchell used to say that her Gone with The Wind characters were not based on real people, although modern researchers have found similarities to some of the people in Mitchell's own life. Scarlett's upbringing resembled that of Mitchell's maternal grandmother, Annie Fitzgerald Stephens (1844–1934), who was raised predominantly Irish Catholic on a plantation near Jonesboro in Fayette, not unlike the O’Hara family. Mitchell was engaged thrice, although only married twice. Her first engagement was to Clifford Henry, a bayonet instructor at Camp Gordon in World War I. He was killed overseas in October 1918 while fighting in France, similar to O’Hara and her first husband, Charles Hamilton. Mitchell’s mother contracted influenza and died shortly before Mitchell could reach home, similar to Ellen O’Hara dying before Scarlett fled Atlanta. Rhett Butler is thought to be based on Mitchell's first husband, Red Upshaw because Upshaw left Atlanta for the Midwest and never returned. Her second marriage was to John Robert Marsh, and they were married until her death in 1949. While the studio and the public agreed that the part of Rhett Butler should go to Clark Gable (except for Clark Gable himself), casting for the role of Scarlett was harder. The search for an actress to play Scarlett in the film version of the novel famously drew the biggest names in the history of cinema, such as Bette Davis (who had been cast as a Southern belle in Jezebel in 1938), and Katharine Hepburn, who went so far as demanding an appointment with producer David O. Selznick and saying, "I am Scarlett O'Hara! The role is practically written for me." Selznick replied rather bluntly, "I can't imagine Rhett Butler chasing you for twelve years." Jean Arthur and Lucille Ball were also considered, as well as relatively unknown actress Doris Davenport. Susan Hayward was "discovered" when she tested for the part, and the career of Lana Turner developed quickly after her screen test. Tallulah Bankhead and Joan Bennett were widely considered to be the most likely choices until they were supplanted by Paulette Goddard. The young English actress Vivien Leigh, virtually unknown in America, saw that several English actors, including Ronald Colman and Leslie Howard, were in consideration for the male leads in Gone with the Wind. Her agent happened to be the London representative of the Myron Selznick talent agency, headed by David Selznick's brother, Myron. Leigh asked Myron to put her name into consideration as Scarlett on the eve of the American release of her picture Fire Over England in February 1938. David Selznick watched both Fire Over England and her most recent picture, A Yank at Oxford, that month, and thought she was excellent but in no way a possible Scarlett, as she was "too British". But Myron Selznick arranged for David to first meet Leigh on the night in December 1938 when the burning of the Atlanta Depot was being filmed on the Forty Acres backlot that Selznick International and RKO shared. Leigh and her then lover Laurence Olivier (later to be her husband) were visiting as guests of Myron Selznick, who was also Olivier's agent, while Leigh was in Hollywood hoping for a part in Olivier's current movie, Wuthering Heights. In a letter to his wife two days later, David Selznick admitted that Leigh was "the Scarlett dark horse", and after a series of screen tests, her casting was announced on January 13, 1939. Just before the shooting of the film, Selznick informed Ed Sullivan: "Scarlett O'Hara's parents were French and Irish. Identically, Miss Leigh's parents are French and Irish." In any case, Leigh was cast—despite public protest that the role was too "American" for an English actress—but Leigh was able to pull off the role so well that she eventually won an Academy Award for her performance as Scarlett O'Hara. A great number of actresses were considered. In fact, there were approximately 32 women who were considered and or tested for the role. The search for Scarlett began in 1936 (the year of the book's publication) and ended in December 1938. Between 1936 and 1938, the following actresses were considered for the role, which required playing Scarlett from 16 years of age until she was 28 (actress age in 1939, the year of Gone With the Wind's release, when Leigh was 26). Between late 1937 and mid-1938, approximately 128 actresses were nominated for the role of Scarlett through letters of suggestion sent to Selznick International Pictures from the public. A 1966 musical stage adaptation was a major hit in Japan and London's West End, but failed to survive in America where it starred Lesley Ann Warren and Harve Presnell. It closed after engagements in Los Angeles and San Francisco, never opening on Broadway. 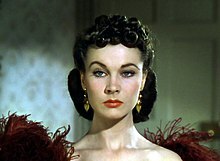 In 1980 a film about the search for Scarlett O'Hara was made entitled Moviola: The Scarlett O'Hara War with actress Morgan Brittany impersonating Vivien Leigh, whom she resembled. In the 1994 TV mini-series based on the sequel Scarlett, the character was played by English actress Joanne Whalley. In the Margaret Martin musical Gone with the Wind, the role of Scarlett O'Hara was originated by Jill Paice. In the South Korean stage production Girls' Generation member Seohyun played Scarlett, alongside Bada, former member of S.E.S..
^ Taylor, 1989 & 62. ^ "Shrewd, Selfish Scarlett: A Complicated Heroine". NPR. Retrieved 2010-09-26. ^ Mitchell 1936, pp. 404, 413, 451. ^ "[T]here was no one in Fayetteville, Jonesboro or in three counties, for that matter, who had so small a waist." Mitchell 1936, pp. 75–76. With a tightly-laced corset, she could fit into a dress with a 17-inch dress. Mitchell 1936, p. 76. ^ Bertagnoli, L. (2006). Scarlett Rules. New York, NY: Villard Books. ^ "Letter from David O. Selznick to Ed Sullivan". Harry Ransom Center - The University Of Texas At Austin. Jan 7, 1939. Archived from the original on 2006-09-07. ^ a b c "The Making of Gone With The Wind" Part 2, Documentary circa 1990s. ^ a b Patterson, Troy, Ty Burr, and Stephen Whitty. "Gone With the Wind." (video review) Entertainment Weekly. October 23, 1998. Retrieved on December 23, 2013. This document has three separate reviews of the film, one per author. ^ "John Kennedy Toole. A Confederacy of Dunces. Novel". 1980. Mitchell, Margaret (1936). Gone with the Wind. Macmillan Publishers. Taylor, Helen (1989). Scarlett's Women: Gone with the Wind and Its Female Fans. Rutgers University Press. Bauer, M.D. (July 25, 2014). A study of Scarletts: Scarlett O’Hara and her literary daughters. Columbia, SC: University of South Carolina Press.